How can Chatbots Help With Your Digital Marketing and Customer Experience? So, you’re wondering what all the chit chat and chatter about chatbots is all about? Great, let’s have a chat then, because, as you know, there’s always a new, shiny, razzle-dazzle object to chase in the digital marketing realm, but chatbots, while still in their nascent stages, are creating a real revolution in customer experience–both from the perspective of the customer and the perspective of brands–especially travel brands. They are achieving the Holy Grail of user experience. They’re providing brands the ability to scale personalized one-to-one experiences while creating the perfect balance between delighting customers, by delivering on their immediate needs, growing revenue and reducing the cost for the brands that deploy them. Make money. Save money. Get great online reviews. Talk about a win-win-win. But What Exactly are Chatbots? Put as simply as possible, chatbots are online tools driven by computer software to emulate human conversation. Some people call them “conversational agents,” or a variety of other monikers weighed down by buzzwords, but we’ll stick with chatbots. Here’s a helpful glossary. They are served through messaging platforms like Facebook Messenger, Slack, WeChat, SMS (texting) or proprietary apps, and they vary in complexity. Some follow very simple “if/then” programming. For instance, “if someone asks [this], then the chatbot answers [that].” These simple versions of chatbots, which can often be set up very quickly are extremely limited in their ability to simulate authentic feeling conversations. They are very easy to perplex. These are not the type of chatbots you find handling customer service requests. The more complex chatbots are running on Artificial Intelligence (AI) and using Natural Language Processing (NLP) or Natural Language Understanding (NLU), which is used for predictive text and in the Amazon Echo and Google Home to interpret user intent. An extra layer of sophistication occurs with chatbots that have Sentiment Analysis on top of NLU. These complex chatbots are learning from interactions with humans, and many of them are tied through APIs to a company’s systems or CRM databases that give them access to essential historic customer information. That’s where chatbots can really give a great experience. Chatbots Sound Cool, but What are They Used for? They’re used for a number of different things, from data collection to information dissemination, and companies in a variety of industries, from healthcare to entertainment, are starting to do some really interesting things with chatbots. The use that is growing the most prominently and rapidly in travel and tourism, though, is using a chatbot for customer service. So, while someone may have CNN.com’s chatbot feeding them daily headlines, and someone else may have what’s known as a Woebot checking in with them through Facebook messenger to see how they feel at any given moment and give them a “pep chat,” travelers and travel brands are starting to see the biggest benefits from chatbots for customer service. How Do People Feel About Chatbots? 95 percent of people believe chatbots for customer service will be the biggest benefit chatbots provide. And Hubspot reports that 71 percent of people are willing to get assistance from a live chat and 47 percent of people are willing to buy from a chatbot. Those are fairly impressive general stats for a young technology, but specific travel brands are also showing the benefits of chatbots for their business and marketing through incredible results that indicate traveler adoption. Let’s Look at Some Examples of Chatbots for Customer Service. First of all, Lyft has a chatbot built into the “Help” portion of their app, and their goal is to get any issue handled within 30 seconds. So, let’s say someone has trouble with their driver finding them. Maybe after a few phone calls between the potential passenger and the driver a pickup still can’t be achieved, but the Lyft customer is charged anyway. That customer can go into the help section and instantaneously dispute the charge, give an explanation, have the chatbot access their customer profile and resolve the issue. That kind of rapid dispute resolution is the type of thing that fills a customer with delight, gets them to share the story and builds brand loyalty. 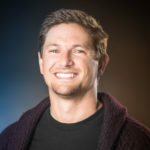 And when Google is reporting that only 9 percent of U.S. travelers “always know” what brand they are going to book before they start researching, there are endless opportunities to capture loyalty during the traveler’s journey, and those smooth-as-butter experiences are the ways more and more modern travel brands will start doing that. Some already are. 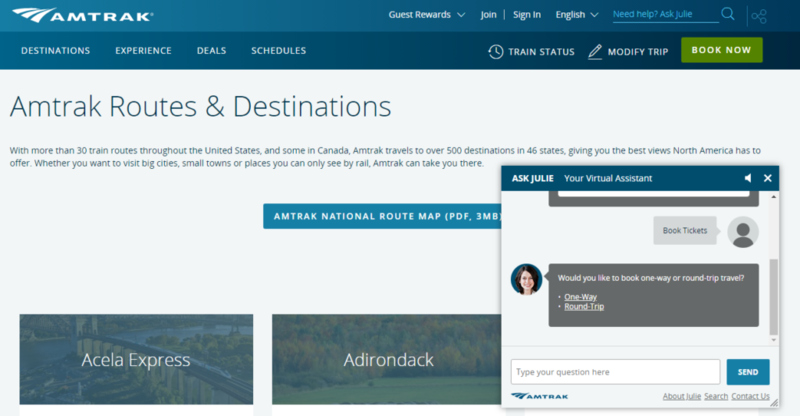 For instance, Amtrak has a chatbot named Julie they implemented more than five years ago. She will never be described as the life of the party because they haven’t created much personality for her, but she definitely takes care of business. Unbelievably, she answers more than 5,000,000 questions each year. That’s five-million mundane questions that a human doesn’t have to answer, which saves a lot of money and frees live agents up for more complex customer service issues that require a more thoughtful approach. They have reported as much as $1M in savings annually in customer service costs because of their chatbot. But Julie isn’t just saving money, she’s making money. Amtrak reports a 25 percent increase in bookings with Julie and a spending increase among those who use her of 30 percent. Those are incredible numbers, making the implementation of a chatbot much more than a marketing strategy–it’s a smart business strategy for travel brands. Let’s take a look at an example that has been good for business and a great chatbot marketing strategy. Rose, the SMS chatbot the Cosmopolitan Las Vegas launched a few years ago is completely aligned with their edgy, quirky, trendsetting brand. As is mentioned by Travel and Leisure, if you ask her what she looks like, she replies, “If you have to ask, I’m out of your league.” If you ask her where to find adult entertainment, she’ll shame you by saying, “I love playing pretend, so I’m going to pretend you didn’t say that.” She also gives art tours, will send you new towels to your room and understands sentiment, so if she senses there is a problem, she’ll kick you over to a live person at the concierge desk. That’s an incredibly powerful combination of a chatbot that’s a customer service tool and a chatbot that is a buzz-creating, brand-building marketing strategy. In fact, Hospitality Technology reports Rose has been able to answer 80 percent of guests questions, and guests who use Rose are 33 percent more satisfied with their stay and spend 30 percent more while on property. In Summary, Chatbots Are The Future. And The Future Is 2019. What Now? 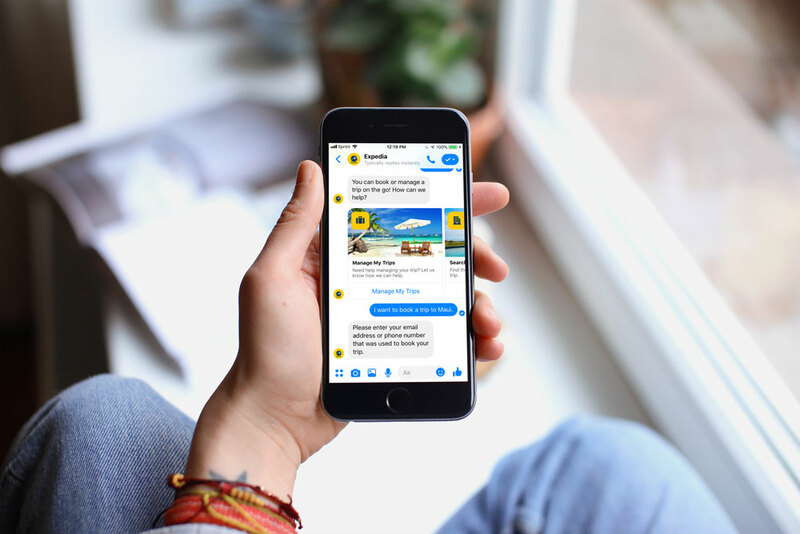 As you can see, a chatbot marketing strategy is a key element for modern travel brands who want to stand out in an increasingly competitive travel and tourism world. But a chatbot is also a rock-solid business strategy–helping save and make money by lowering customer service overhead and increasing the ease of spending by travelers. It’s predicted that an overwhelming majority of big businesses will be using chatbots and that AI will handle a vast majority of user requests in the next five years. They can be useful to both travel brands and travelers–the UX utopian state! They help save customer services costs. They’re never tired, never sick, can answer dozens of requests simultaneously and handle the most mundane and repetitive inquiries, which frees up human customer service agents to be fresh and engaging for the most complex requests. They can provide better customer experience because they’re always available and can solve problems instantaneously in a personalized way that delights customers. If using the correct technology, they can align with a brand’s personality. They can encourage more booking and spending through convenience. They allow brands to scale one-to-one personalized interactions, which has been difficult until now. What should you do if you are interested in a chatbot marketing and business strategy? Make sure you define a clear strategy that solves a business and/or marketing problem and achieves a goal. Pick the right level of technology and delivery system based on what you’re trying to accomplish. Align the personality of the chatbot with your brand through a conversational strategy. Always make sure that part of the conversational strategy is being transparent that the chatbot is a chatbot and not a human–that sets consumer expectations. Develop a promotional and adoption strategy.